Alpine Fishing Guides offer half day, full day or multi day trips. We offer drift fishing trips using comfortable white water rafts which are fitted with rowing frames and seats or 4wd walk and wade, sight fishing trips or a combination of both with multi day packages. A popular choice is our 3 to 4 day packages which have a mixture of walking and drifting. This is a great way to experience the different types of fishing that New Zealand has to offer. For the more adventurous there is also a heli fishing option which allows you to access the more wilderness rivers using a helicopter if your time is limited and your budget allows. This does not include a New Zealand fishing license. They are currently $25 per day or $160 (non resident) , $123 (resident) for a full season. They can be organized by us with the help of some info from you i.e. Name/ Country of residence /Date of birth and added to your daily rate or easily purchased online under the New Zealand Fish and Game website. Multi day trips are a great way to see and fish various New Zealand rivers from large to small , back country to front country. It also allows you to take in a variety of New Zealand’s beautiful scenery . You could use Wanaka as your base and be picked up and dropped of to your accommodation daily. Or if you were wanting to maximize your days and cut down on daily travel times then a multi day road trip may be suited to you. Day 1 – Pick up from your local Wanaka accommodation and drive to a river or stream for a full day walk and wade , Stay the night at a local hotel, motel, B&B, or camping ground cabin etc . Eat dinner at local restaurant or pub. Day 2 – Float a large river for the day. Drift fish from the raft as well as frequently stopping and wading , Stay the night at a local hotel, motel, B&B ,or camping ground cabin etc. Eat dinner at local restaurant or pub. Day 3 – Walk and wade a different river for the day and return to your Wanaka accommodation late afternoon. The above option can be tailored to suit or could be more than the 3 days . The usual daily rate applies here plus accommodation and dining for yourself as well as the guide, Lunches and drinks are part of the daily rate. Please contact us for prices or any questions you may have. This includes 4hrs guided fishing ( usually 5hr trip total with travel) pick up and drop off to accommodation, all equipment if required, drinks and snacks. Alpine Fishing Guides can organize heli fishing to remote wilderness rivers if your time is limited and your budget allows. Please contact us for prices as they may vary considerably depending on flight time. We can offer some very competitive rates. Our rates are discounted through the months of winter, June, July and August. Some excellent fishing can be had even if the days are shorter. Stripping a streamer is productive and also spin fishermen have great success at this time. 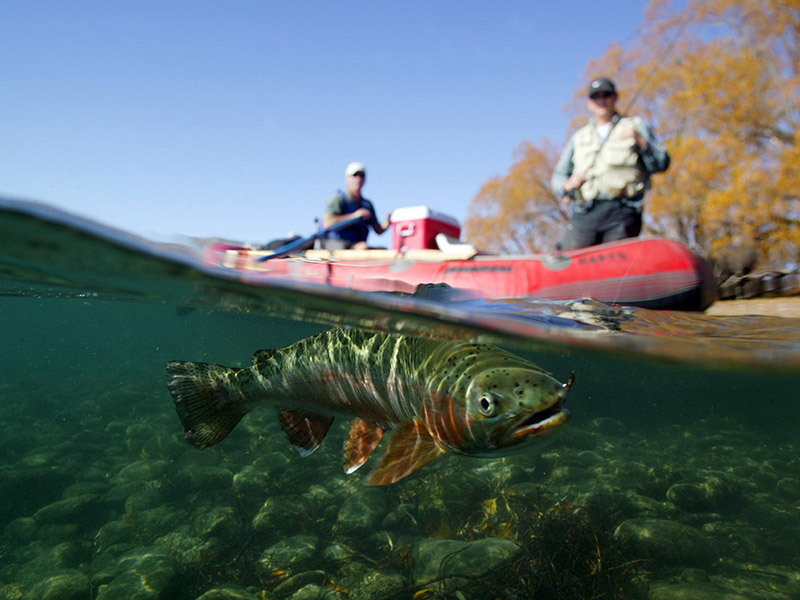 It is a time when large fish can be caught as they make their way up river to spawn. So if the snow is a little icy to ski or the legs are in need of a day off, come spend a half or full day drifting the Clutha, We carry hot chocolate and muffins to keep you warm! Alpine Fishing Guides have all the gear you may need from quality rods to waders and boots and of course we provide flies, tippet etc at no extra charge. The prices you see are what you pay, no hidden extras! Alpine Fishing Guides can also organize day hunts for Red and Fallow deer, meat (all year round) hunts are available at reasonable rates. Please contact us for pricing and details.